It is very on trend at the moment to ‘get naked’. No, we’re not getting into the realms of anything naughty here, we’re talking Naked Wedding Cakes! 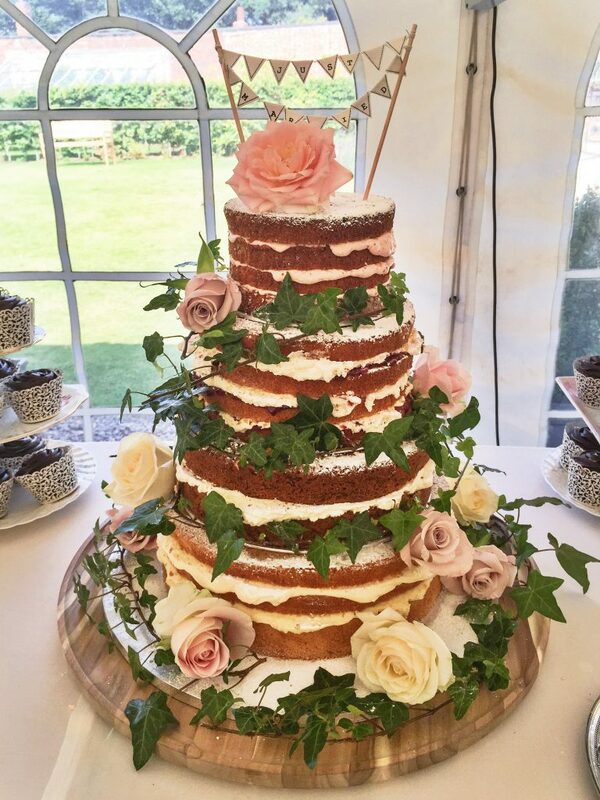 The naked cake trend started in 2015, with the advent of the ever popular “Rustic” look. Teamed with Hessian, Lace & a little bit of wood, it all became a marriage made in heaven, if you’ll pardon the pun? Choices of decorative styles are endless too. 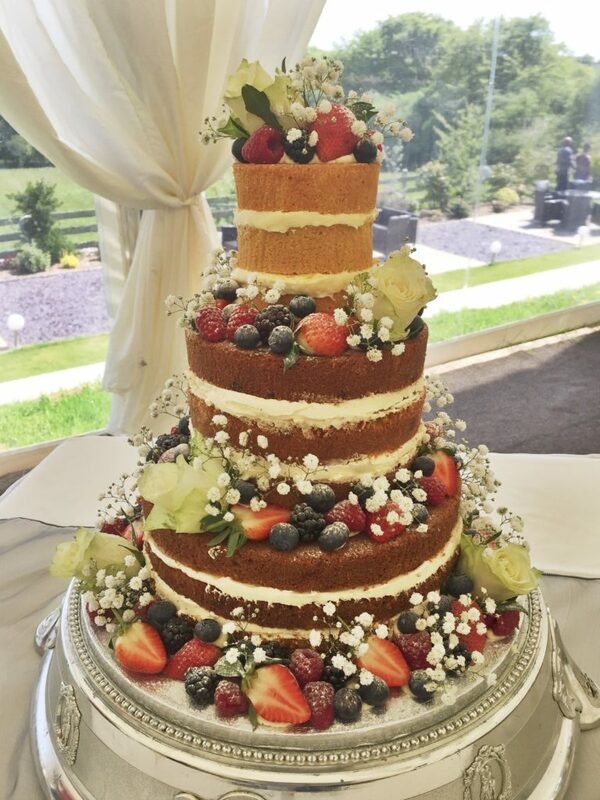 From all floral, to a mix of flowers & fruit, & finally cakes simply groaning under the weight of seasonal berries, the options are as unique as each couple. 3 things to think about with a Naked Wedding Cake. 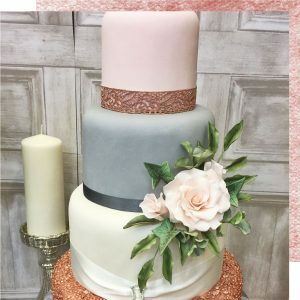 As the wedding cake is naked, you’ll see the sponge that it’s made from, which means that if you are looking for a pale naked cake, then you’ll not want to add any dark chocolate tiers to your cake, as this will break the cake up with a chocolate colour, instead of an all fluffy, pale sponge. If you do have chocoholic tendencies, then white chocolate & raspberry is always a nice idea, as it won’t alter the pale look of the cake, but still gives you your chocolate fix! 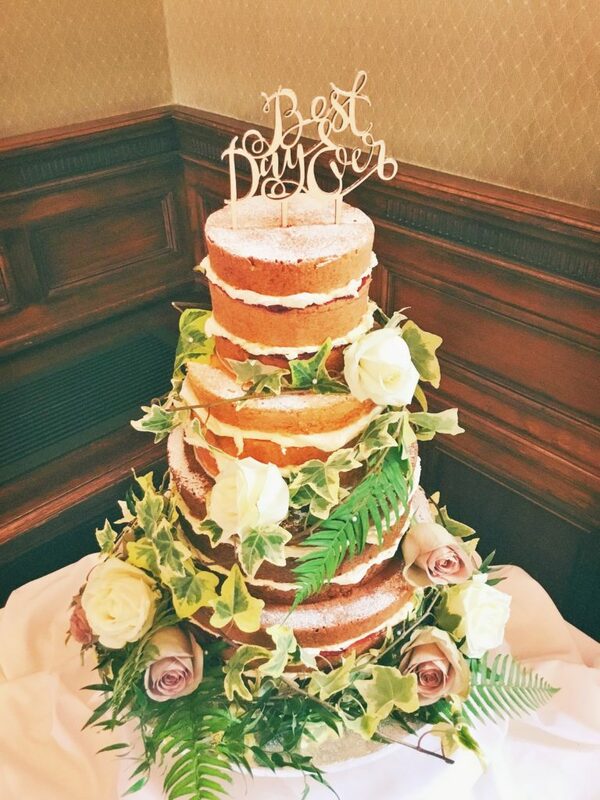 A naked cake needs to be given a little extra love & care, because it doesn’t have the protection of icing -the sponge is exposed to the air, so you will want to speak to your cake designer to make sure they can make it, deliver it & set it up as close as possible to the ceremony, so it’s not standing out too far in advance, which could make it dry. This may be enough to put you off having one, but please don’t let it! Just speak to your cake maker, as any decent cake maker will know that this is key too, so it shouldn’t be a problem. It’s highly unlikely that your venue will have a fridge big enough, or even the room to accommodate a stacked cake, but this is the only type of cake that’s suitable for refrigeration, it’s always worth an ask. 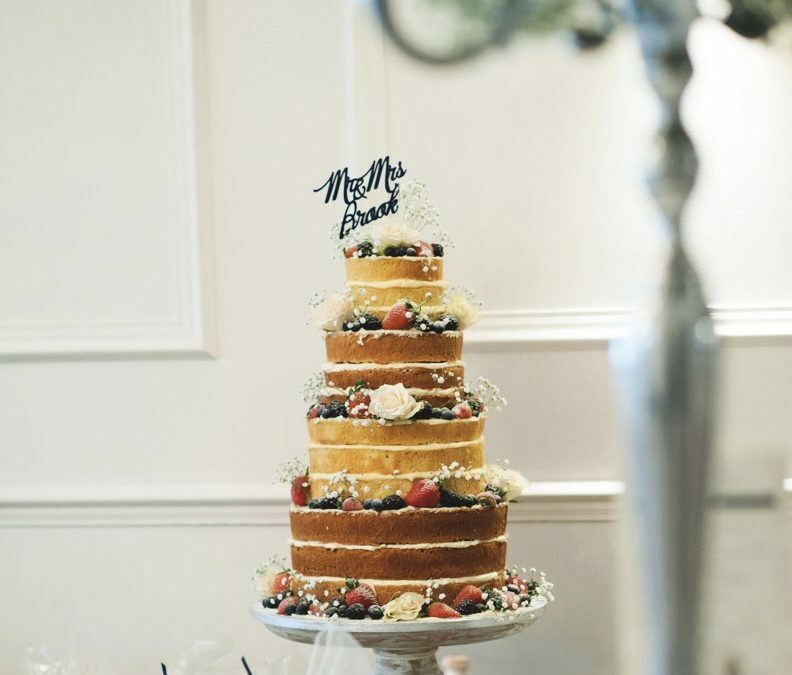 The world really is your oyster when it comes to decorating a naked cake. However, here’s a couple of tips on what not to use. Flowers look fabulous, but make sure those to be used aren’t heavily scented or more importantly, that they aren’t poisonous! There are some flowers who’s sap is highly toxic, so should never be anywhere near anything edible! Don’t worry – your florist will be able to advise on that. If fruit is your choice of decoration, you may need to check with your guests to see if anyone has an allergy. Our thoughts always turn to gluten or nuts when allergies are mentioned, but there are some poor soles who are allergic to Strawberries! Most people will steer clear of anything they’re not sure about, but you never know with children, so it’s a good call to ask. Then we get to toppers! 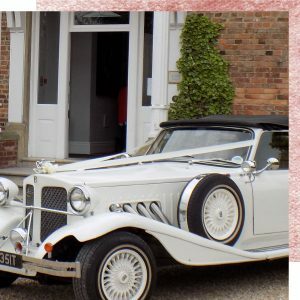 These can be more of the same flowers or fruit, tiny ‘Just Married’ bunting on tiny poles, or my favourite, your names laser cut from wood or perspex, in a colour to compliment the rest of the wedding. 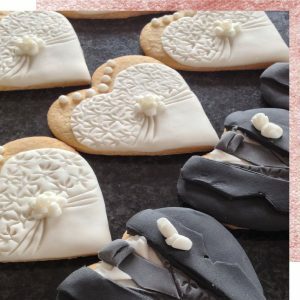 I love looking at www.Etsy.com for topper ideas & there are some fab local companies too. Let me know if you want their details. I love the naked trend. 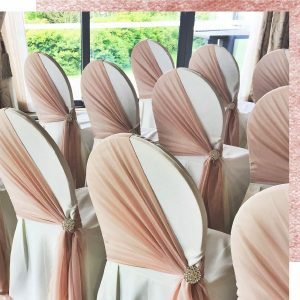 It suits a rustic, naturalistic wedding really well & always gives me a more relaxed & laid back vibe! 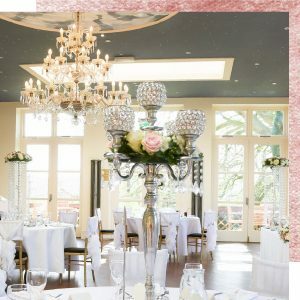 I think it’s really important that when making decisions about the cake & other elements of the day, you take into account the venue itself & what will suit the setting as well as your theme. Naked cakes are perfect for barn weddings, or venues with lots of wood & beams, they have that relaxed vibe I mentioned before. 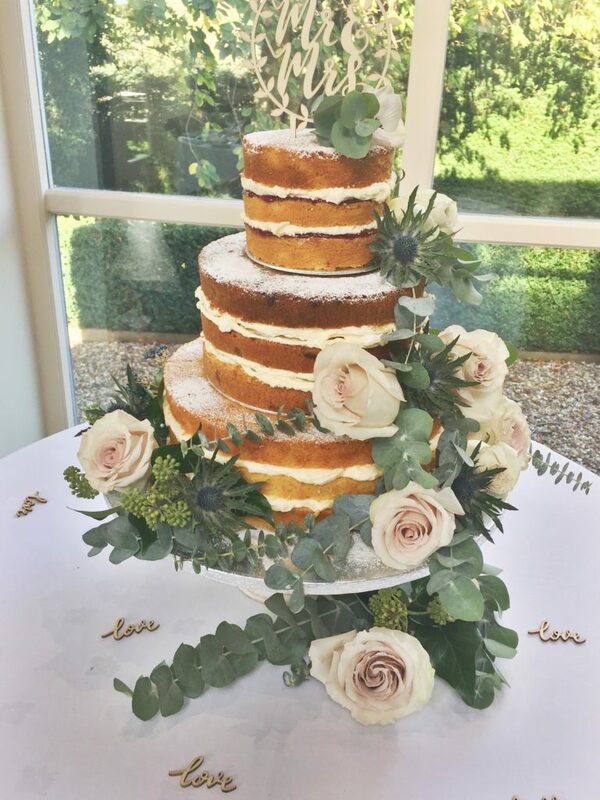 At Iced & Spliced by Cakey Wakey, we’ve worked with some beautiful brides to create their perfect naked cake, with lots of giggles along the way ( for some reason the word ‘naked’ seems so apt for a wedding.) You can see some of these creations through this blog post.There is more work to them than there looks – getting the perfect consistency & moistness of the cake right, to withstand the decorations & celebrations on the day, baking the sponges the evening before the wedding, decorating at the last minute, it all adds to the fun. I love to talk cake, so if you have any questions, just pop me a message in the box below, or comment & I will come back to you with any other helpful cake tips. Now, let’s have lots of fun deciding how naked you want to get! Or, if this is too steamy for you, we can always look at semi-naked…… but that’s a whole different blog.